One of the main points of opposition to drilling at ANWR seems to be the concerns about the effect on the local wildlife. 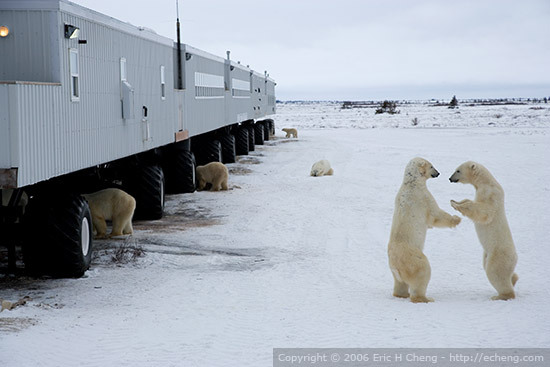 So, let’s see how wildlife is being affected at Prudhoe Bay, about 100 miles west of ANWR. 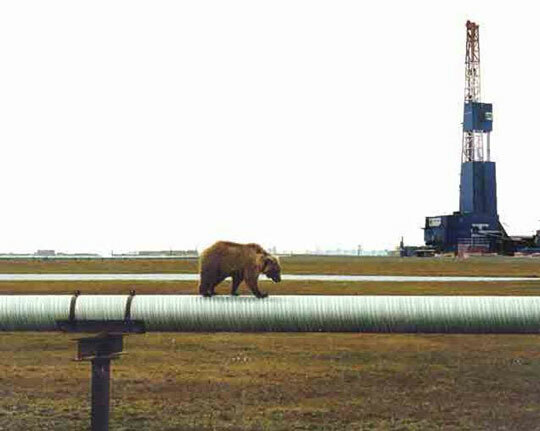 The bear is strolling along a Prudhoe Bay pipeline. It would appear that he is taking advantage of the pipeline, not avoiding it. to undue stress? We should all be so laid back. 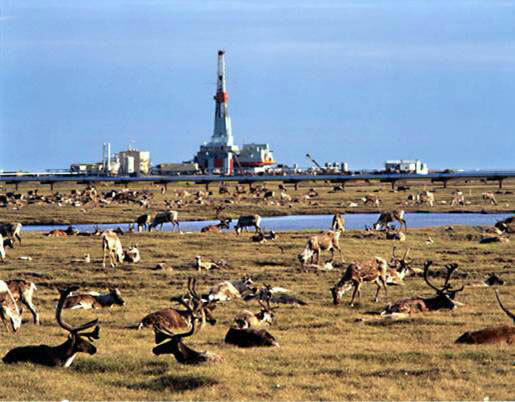 From these images, one might conclude that caribou and bears have adapted to the presence of oil wells and pipelines in Prudhoe Bay, Alaska. Perhaps the same will be true for ANWR. Maybe we should do some actual research instead of generating rumors. Who benefits financially from extending our dependency on foreign oil? Could it be the same people who benefit from promoting the threat of global warming? And for those who claim that these bears are Photoshopped, here are a few more images to admire. 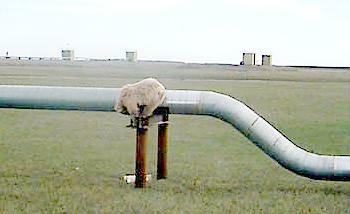 Bear and pipelines, you can’t seem to keep them apart. What is the world coming to? Read more about these images here, here, and here. 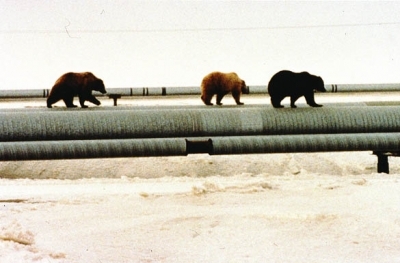 This entry was posted in News blogging and tagged ANWR, bear on pipeline, Caribou, Prudhoe Bay. Bookmark the permalink. Sorry David I have to disagree with you on this one. I feel some places should be left unspoiled, as God created it. Some call it progress, I call it greed and short sighted. I know you are not a native of Floyd and I know you love the small town life the way I do, but if an oil refinery were to be built in Floyd I have a feeling you would not like it very much. Maybe you’d adjust. My guess is that you would fight it or move. David, I have a feeling that the opposition from many is not specifically to the point of drilling (although it is an issue for some), but that it will be done without consideration of any other options? I don’t live in the US (I am in Canada), so I might not know what I’m talking about, but I sense that the opposition is more to the idea of thinking that this is going to solve our problems. I think that if it was approved in conjunction with other initiatives — conservation, alternative energy initiatives, etc. — to show that it was just one piece of a broad strategy for dealing with energy depletion, there would not be so much opposition. I think it’s seen as an issue of croneyism — a bunch of rich white guys going out to drill for more oil to make more money. If it was put forth as part of a bigger strategy that included some kind of timeline for gradual repeal of foreign oil dependency, I think it would make sense to more people. If this strategy also demanded some personal investment from industry and the population — a commitment to reduce consumption — it would be easier to swallow. Otherwise, I think it’s seen as a way to keep the SUVs running for a few more years to no useful end. If we do not use our nation’s oil now then it will still be there tomorrow when the need is even more acute. Oil also makes plastics, synthetics, and other substances more precious in the long run than “fuel”. If we wean ourselves off oil for fuel now then we improve the situation for the foreseeable future. But politicians claiming drilling will fix our problems are telling comforting lies, while the amount of oil in Alaska is minuscule compared to current consumption. It does benefit a few small companies significantly which can benefit politicians through kickbacks and patronage. Dependency on oil is the problem. Fix the problem. Converting the nations supply of SUVs to efficient vehicles would be a bigger advance than drilling. But you constantly hear that our vehicles are our lifestyle from administration officials who have many and deep ties to the oil industry. These are people with a vested interested in milking the current status quo. I agree with all of them to a certain degree. I think there is no silver bullet. Drilling in all of the domestic locations known to contain oil will only delay the day of reckoning. Renewable energy and more efficient use of that energy will certainly give the human race a little more time to come to terms with a planet that has finite resources. We see few examples of energy conservation from senior members of either party or public figures like Al Gore or UN agencies. When we start seeing public figures acting responsibly in terms of personal energy consumption, then it will be time to listen to them. You can tell by their lifestyles who is milking the current status quo. Include those who jet off to Bali and other luxury destinations to discuss world hunger, global warming, etc, while dining on catered cuisine flown in from all over the world. No party is free of corruption and all are heavily invested in building their own “Bridge to Nowhere” using pork barrel tactics (home-state projects, known as “earmarks,” that they slip into unrelated legislation). Finger pointing will resolve nothing. Obama, McCain and many ordinary citizens have a personal stake in oil companies through their mutual fund investments. Revealing all the facts may open the way to solving our present and future energy problems. Covering up will solve nothing. The one thing I have noticed is that whatever is being hidden or being altered is being done so to conceal wrongdoing. More open communication and less defensiveness will eventually lead to a resolution. The Internet is the open forum which may eventually make this happen. I’d be happpy if we could just drill in the sections of ANWR that were designated for drilling when ANWR was created. What happened to that agreement? David, I agree about the behaviour of politicians and people like Al Gore; but, collectively, the consumption of the general population is way greater than theirs. If we wait for them to improve, we may just make things worse for ourselves due to rapidly increasing energy prices. Does the government represent the people anymore? If not, we shouldn’t look to them for guidance. Another point about ANWR is that the oil may not come online for 10 years if planning was started today. From that perspective, it’s similar to planning nuclear electricity generation stations… you have to be able to forecast demand that far in advance. Will we need all the oil we can get in 10 years’ time? Great Blog! I am going to post a link from mine to yours if it is OK with you. If you want to reciprocate, that is fine. If no, thats OK too. I saw a TV commercial the other day with an actress, tears streaming down her face, relaying how the poor polar bears are swimming in circles until they drown because of the melting ice. It would make any normal human being feel just terrible …. the problem is that it is all a big lie. There are approximately 5 times as many polar bears now than there were in the 1970s. My folks got back from a 3 month trip to Alaska, my mom even went to an Eskimo village above the Arctic Circle … neither saw the terrible environmental tragedy unfolding in Alaska … incidentally, neither did the Alaskans they spoke with.